Kapok is a tree that is native to the rain forests of South America and West Africa. The material that is used for stuffing pillows comes from the tree’s seed pods, and it is a silky fiber that is harvested in a sustainable way and traded fairly. Kapok pillows provide an all-natural and ultra-soft feel that can make you feel like your head is resting on a cloud. 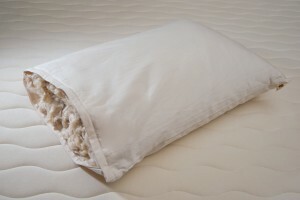 Best of all, they are hypoallergenic, making them a perfect alternative to down pillows. High-quality kapok pillows are made with soft and smooth organic cotton casing with a satin-like feel and a zipper enclosure. Hence, you can easily add or reduce the kapok fibers and have a pillow that can suit your desired level of comfort. Pillows that are made with kapok fibers come in standard sizes, like the regular 20”x26”, king (20” x 36”), and queen (20” x 30”). Organic cotton is used for the casing of kapok pillows, adding to their hypoallergenic qualities. You do not have to worry about suffering from allergies and itching every time you sleep. Another important characteristic of kapok pillows is they are free of toxic chemicals and substances. Kapok grows naturally in the forest and never require pesticide treatment. The fibers are harvested ethically, too, and they can be transformed into stuffing for the pillows without harmful chemical treatments. Hence, all you get are pure and clean pillows that are safe will not cause any long-term health problems. You do not have to worry about inhaling toxic chemical fumes, too. Kapok pillows are naturally resistant to dust mites, and they possess antimicrobial properties. Hence, they are healthier for you. In case you sweat, the pillows can easily let moisture dissipate, so they will not become a breeding ground for bacteria, mold, and fungus. Kapok pillows are ideal if you want a more comfortable sleep surface for your neck, head, and shoulders, too. They can easily be adjusted, so you can wake up without sore spots, aches, and pains.